Steelsmith Inc Steel Buildings » Who Works on Your Steel Building? Project Manager – This team member’s job is to manage the entire project from start to completion. They have knowledge of each phase of the process, and make sure that everyone who is working on your steel building function cohesively as a unit. Their expertise in best practices and building methods will ensure that your steel building will be customized specifically for your needs. 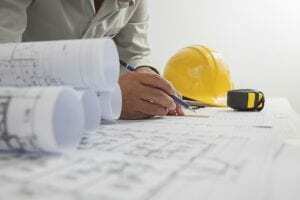 They will be the main point of communication with the client and will continually strive to bring your vision to the blueprints and construction site. They will also manage any sub-contractors that may be needed. Estimator – The Estimator’s job is to create a forecasted cost of your building in the initial planning stages of the process. They measure every single part and hour of labor that should go into your steel structure. They create what is known as a Quantity Take-Off (or QTO), which is the detailed breakdown of your entire project’s cost and where it is derived from. This is one of the first team members you will interact with. Designer – The Designer will create the initial drawings and blueprints for your steel building. They will take your required specifications and blend them with your local building codes and customize a steel building specifically for your need and location. Whether you are looking for agricultural storage or are building a warehouse, they can adjust their design for any application. Erectors – The erection crew unloads and constructs your building. Your erection crew will be certified, trained, and experienced specifically in steel building erection. Certified crews will get the job done faster, safer, cleaner, and better than non-certified crews. You can also be assured that the job will be done correctly. It is essential to remember that steel buildings are a unique type of building that requires a specialization and concentrated experience throughout the steel building company. Remember to always ask for both industry and customer references from the steel building company with which you are working. They should be able to provide a wide range of references for their steel buildings, including projects completed a long time ago, projects completed recently, and projects they are working on now. This will help guarantee that a steel building company has the experience and expertise to handle your project.